Australian cricket squad, led by Steve Smith, arrived here on Monday ahead of intriguing four-Test series against India, starting at Pune on February 23. The team is scheduled to depart for Pune for their first encounter after playing a warm-up match against India A at the Cricket Club of India’s Brabourne Stadium from February 17-19. Australia previously tour to India back in 2012-13 that resulted suffering a 4-0 whitewash. 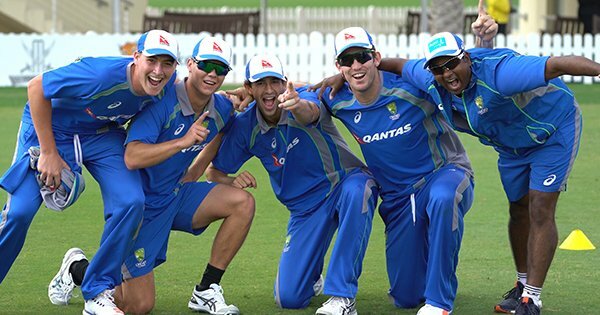 However, this time the Aussies have raised up their confidence and all set to take on hosts after finishing their tasks in a gruelling training camp in Dubai. Australia squad: Steve Smith (Captain), David Warner, Matthew Renshaw, Shaun Marsh, Peter Handscomb, Mitchell Marsh, Matthew Wade (Wicket Keeper), Steve O’Keefe, Mitchell Starc, Nathan Lyon, Josh Hazlewood, Ashton Agar, Usman Khawaja, Jackson Bird, Mitchell Swepson, Glenn Maxwell.